When you have ammo you can tap on the shotgun icon to shoot targets. 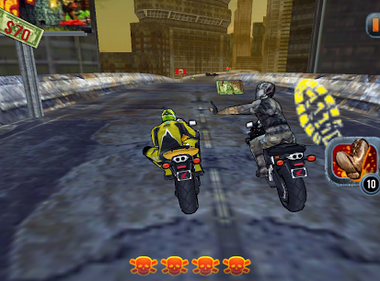 The skulls icons at the bottom of the screen indicate how much health you have, you lose health when you run into a zombie or are hit by a rival, If you run out of skulls you fall off your bike and lose. If your bike is now 'Charging', try to run over as many zombies as possible while charging to extend the length of your charge!